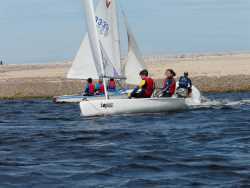 A safe and fun filled introduction to sailing in Taz or Topaz dinghies. The course will follow the RYA stage one syllabus and will teach you how to rig, launch and sail your dinghy wherever you want to go. Launching and recovery, steering, parts of the boat, basic sailing.